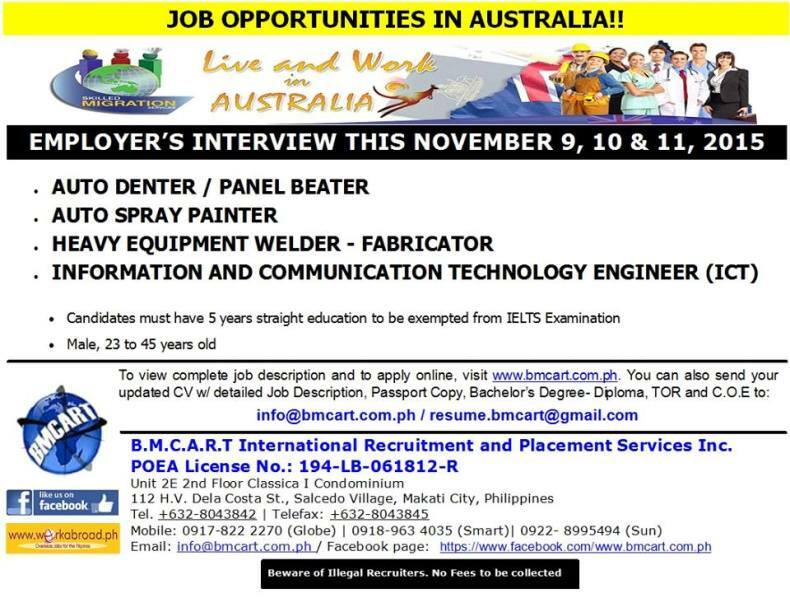 Makati based manpower agency, BMCART International Recruitment and Placement Services, Inc. has been in the industry for 8 years, the have been recruiting and deploying Filipino workers to overseas clients since 2007 up to present. 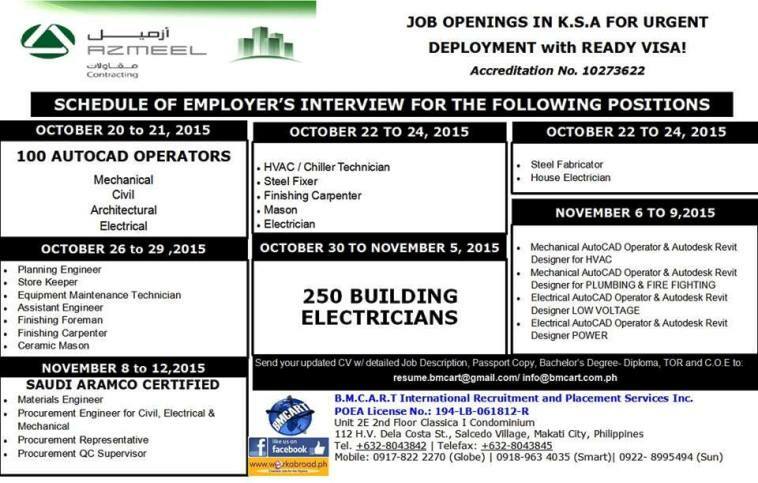 Here is their latest job openings, and POEA accreditation status. BMCART deploys highly skilled and experienced workers in the field of construction, manufacturing, healthcare / medical, oil and gas, hospitality, recreation / education, Information Technology (IT), heavy equipment machineries, logistics and warehouse to different countries which include Singapore, Kingdom of Saudi Arabia, Brunei, Kuwait, Malaysia, Australia, Qatar, Canada, and United Arab Emirates (UAE). The agency usually post their openings thru popular social networking site Facebook. Here are their job vacancies as of the writing. This part will be updated from time to time if they post new jobs on their FB page. Here are the list of job openings with approved job orders based on Philippine Overseas Employment Administration. 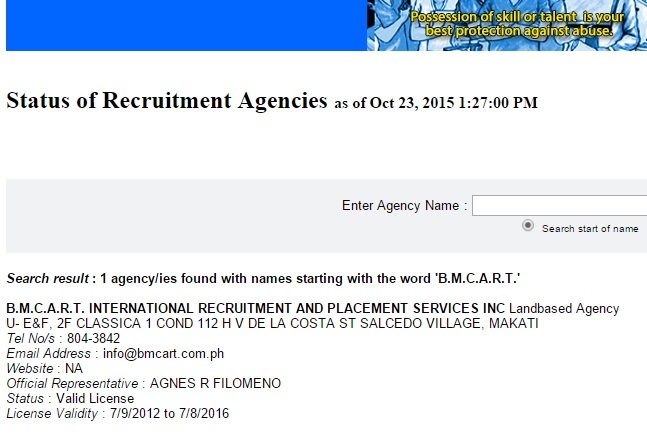 Based on POEA website, BMCART International Recruitment and Placement Services Inc. is a landbased manpower agency in the Philippines. 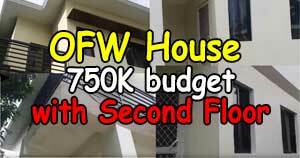 They are headquartered in NCR located at Unit 2E 2nd Floor Classica I Condominium 112 H. V. Dela Costa Street Salcedo Villange in MaKati City with ZIP code number 1227. BMCART is a POEA accredited agency with license number 194-LB-061812-R. Their license is valid from July 9,2012 until July 8,2016. Their website is bmcart.com.ph and their facebook page is www.facebook.com/www.bmcart.com.ph. For inquiries you can send them email at info@bmcart.com.ph or call their office thru this numbers: (+632) 804 3842 / +639189634035 (SMART) / +639178222270 (GLOBE) / +639228995494 (Sun Cellular). 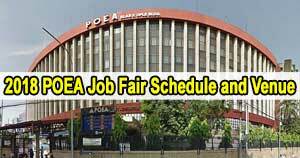 Interested parties / applicants should check the agency’s listed job openings based on POEA website and Facebook page (stated above). If the applicant has spotted a vacancy that fits their work experience, they should call / email the agency and inquire if the vacancy is still active. 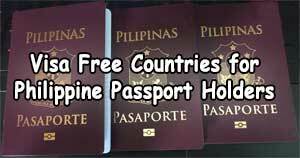 If it is active, ask for the documents required for application. Prepare the documents and submit it to their office to begin your application. Note: This blog is not in anyway related to the featured agency. For own safety please do not place on the comments your full name, contact details, and address. 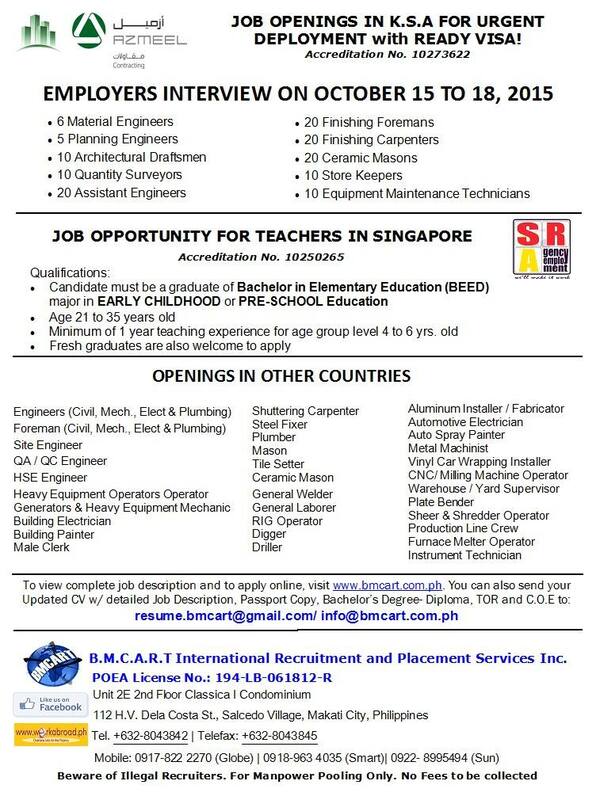 Please direct only your job application to BMCART personnel.